Classic Curves Jewelry - This is a bold high polished sterling silver necklace accented by a large oval Black Onyx Cabochon. This pendant is complemented by a 24" handmade sterling silver square link adjustable chain. From our Classic Curves Collection - This is a bold high polished sterling silver pendant handcrafted from square silver tubing arranged in a classic design. 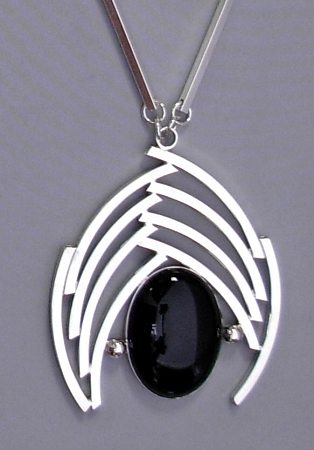 These sweeping curves frame a large oval black onyx cabochon that is fully bezeled in sterling silver. This gorgeous high polished statement necklace is complemented by a 24" adjustable handmade sterling silver square tubing chain. This Pendant measures 2.6" long x 2.1" wide. The Black Onyx cabochon is approximately 1.2" long x .86" wide (30mm x 22mm). Black Onyx provides strength and stamina in stressful times, by absorbing negative energy. The chain's closure is a Hook/Eye clasp. This is an artistic work of art that is designed, created, and signed by Aaron Rubinstein and Modern Art Jewelry.